We anticipated November 2 to come, since we knew that today is the day when T-Mobile will finally put the Motorola CLIQ on its shelves for everyone who wants one. 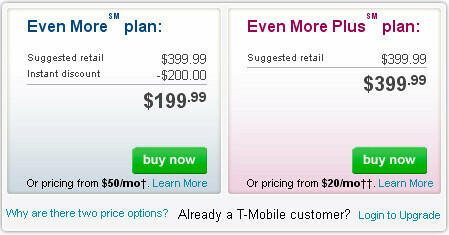 Until now, only current T-Mobile customers could purchase the first MOTOBLUR-powered Android handset, but now the carrier has kept its promise and made the phone available at a price of $199.99 with a two-year Even More plan or at $399.99 with an Even More Plus plan. For the unacquainted ones, we’ll say that the Motorola CLIQ was the first Android phone to be announced by the manufacturer. It comes with a 3.1-inch HVGA touchscreen, 5-megapixel camera, A-GPS, microSDHC slot, Wi-Fi and 3G. It also features a side-sliding QWERTY keyboard in order to deliver some handy typing experience, as it is oriented towards social networking. For the purpose, Motorola has developed the MOTOBLUR interface that is capable of throwing information like messages, updates, e-mails and photos directly at your homescreen. When you see it in person, it doesn't look like a kids toy at all. Thats what I thought until I saw it this morning. Although, the white version could be seen as more "kiddy". But it's way more better built than other kiddy sliders out there. I just got back from the Tmobile store, they didnt have it on display but the salesman brought one from the back. The build quality is impressive, the screen is glass and when you open it, it locks with a nice solid click and the sliding action is smooth, almost like it's on ball bearings. Also, when you open it, the rear of the screen is stainless steel. The phone has a good weight, I was very impressed with the phone. So when you add the motoblur, its a very tempting phone. A cool feature is the glowing motorola logo on the back of the phone, very neat. I might end up getting this phone! HOnestly I know its No SHoles but I've handled it and Really its Build quality IS very Nice I just wish it had a faster Processor and bigger screen. Honestly thats what is keeping me from getting this in the Meantime while I wait for a Higher end Android phone. Pitty it would have been a nice stepping stone between my G1 and a new higher End Android. I got this phone a month ago, and I love it! I think besides the smaller screen it matches the Droid,after seeing the video review of the Droid I was not to impressed. i do not understand your username? It's a play on "homosexual" and the abbreviated version of "technology", "tech" = homo-tech-ual What it means, however, who knows. He sticks to his own kind with technology?